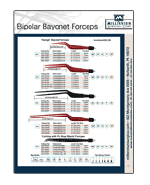 Bipolar Bayonet Forceps - Full Line	Yasargil, Cushing, Hardy, Scoville, Gerald, K-Yasargil, MIS K-Yasargil, Malis, Key and Keyfin, Semkin, and more. 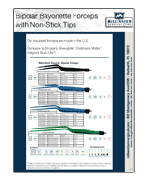 In handswitch, non-stick, titanium, and more. 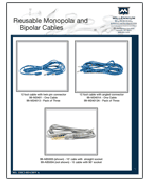 Bipolar Cables - Best Sellers	Our best selling bipolar cables, with angled and pin connectors, available individually or in packs of three. 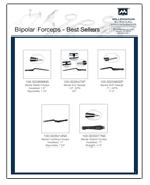 Bipolar Forceps Best Sellers	Our best selling bipolar forceps including patterns such as Adson, Jewlers, and Yasargil, and bayonet styles. 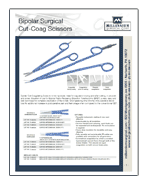 Bipolar Surgical Cut-Coag Scissors	Bipolar Cut-Coagulating Scissors in two tip styles. Ideal for coagulation during and after cutting, in pinpoint and zones. Heavy-duty synthetic blue insulation. 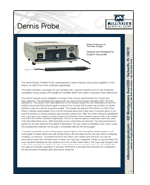 Dennis Probe	Designed to perform bipolar submucosal coagulation. Pencil grip for easy handling with a bayonet needle mount for easy intranasal view. 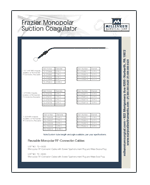 Frazier Monopolar Suction Coagulator	The Frazier monopolar suction coagulator is insulated, angular, with an RF-connector. 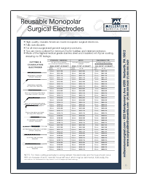 Brochure includes monopolar cable ordering details.